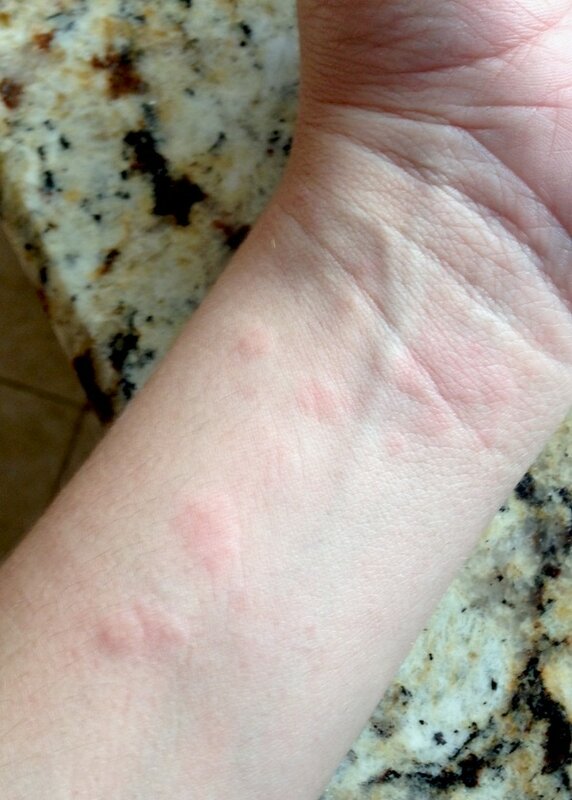 I’m going to post some pretty nasty pictures on this blog post about my chronic hives. So if you aren’t into seeing some graphic material – do not scroll down. There’s no other way of explaining what I’m going through without the visuals. So here is your FAIR WARNING – if you don’t want to see the hives, then please don’t read on. 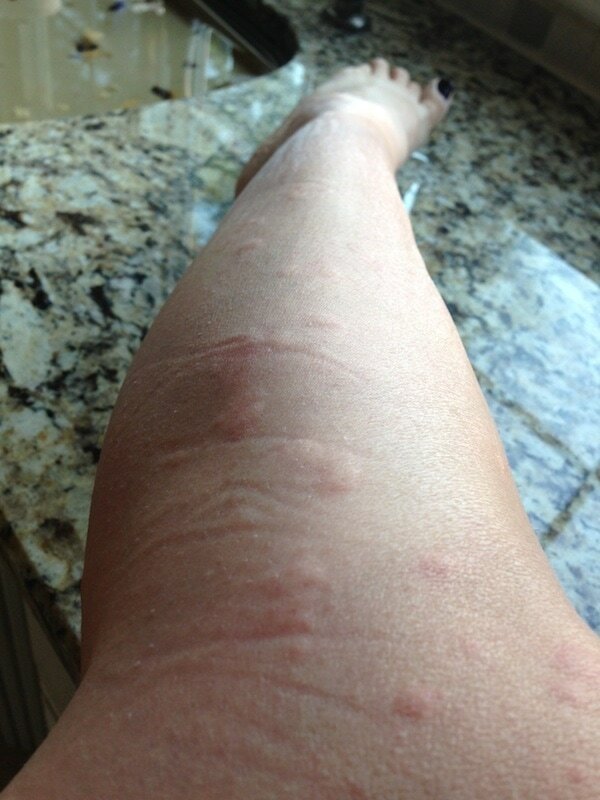 Click on the continue reading link below to see the rest of this post and read about my chronic hives. A week or so ago I woke up choking on phlegm. I was gasping for air and coughing up a storm. I thought I got sick overnight. I wasn’t lightheaded or dizzy (symptoms that usually accompany a bad cold). I just had this inability to breathe and all this phlegm. I got up out of my bed and walked into the kitchen to get some water. In about 5 minutes – it all went away. I was totally fine. I thought that was strange but let it go and moved on. The next night the same thing occurred – lots of phlegm, a hard time breathing… but this time it was accompanied with a body filled with hives. And not just little hives. 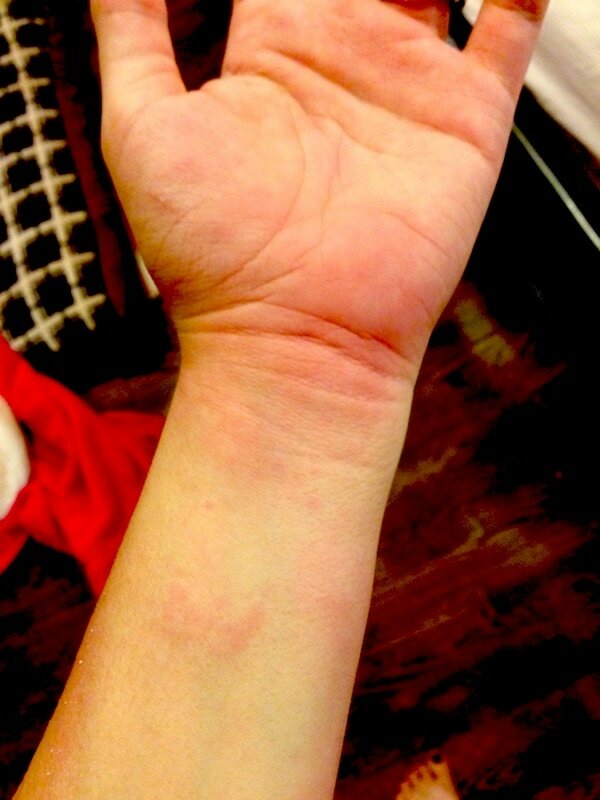 I’m talking welts. I was so itchy I didn’t even know where to begin! I downed some Benadryl and went back to sleep. In the morning, we took the sheets off and washed them in Tide Free and Clear. I was using a cheaper detergent that I got on sale and thought maybe that was the cause. We washed everything from the mattress pad to the pillow cases. I put my comforter in the dry cleaners because it didn’t fit in my washing machine and used my daughter’s instead. Nighttime followed and I went back to sleep feeling hopeful. But no such luck. Ready for the pics? You can’t REALLY tell in this picture but my knee is SO SWOLLEN. Besides it being red – it was HUGE. This is just a portion of my mid-region. It was like this all the way around. Again, the hands are just the same – completely swollen. 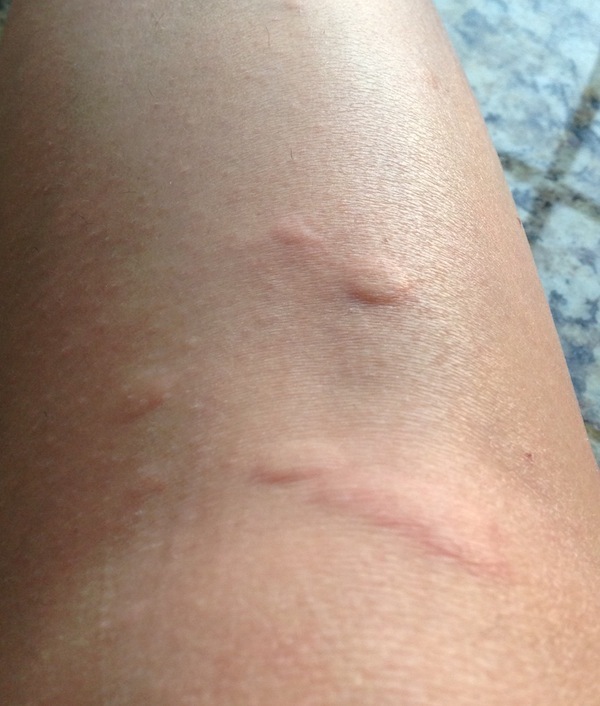 They actually hurt ON TOP of being ridiculously itchy. Here’s another shot of my knees. I mean – LOOK at all those hives! I was dying. It was all over my body. Even my scalp and feet. Thankfully, the Benadryl clears it right up. But I get so tired when I take it which is no fun for my children or my husband. THANK GOD he is home with me because this week would have been a DISASTER otherwise. We went to Bed, Bath and Beyond after day 4 or 5 of this nonsense and bought new pillows, allergy covers, allergy spray etc. I shop vacced my mattress and the entire room. I rewashed EVERYTHING again and hoped for the best. So… it’s still happening. But they are smaller hives. Unfortunately, they are still everywhere. This morning, they were even on my face. But thank GOD I am breathing ok. I’m no longer losing my breath in my bedroom. That was my number one concern. My detergent did change – but we switched back to the old detergent and have washed everything with Free and Clear. I can lay on my bed with my kids and play video games for a few hours and not react. My hives start to present when I am wrapped up in my comforter and am warm. The heat is triggering the hives. I no longer think it’s the detergent. The comforter I am using has been cleaned with a Free and Clear detergent but it still gives me a reaction. So I don’t think it’s the detergent anymore. I’m really leaning towards heat. I read online about chronic hives. 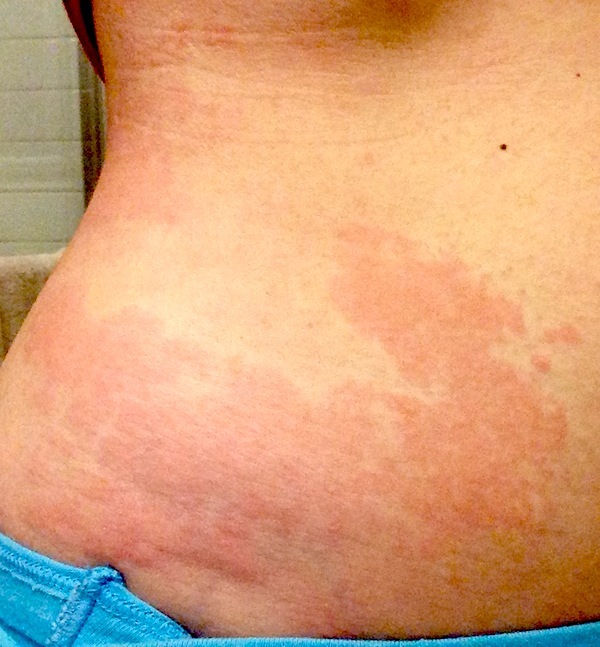 Hives that just come out of nowhere and can last for YEARS and YEARS. I have a HORRIBLE feeling that this is what this is. I’m heading to an allergist tomorrow but I don’t think that I am going to get much support there. I know I am allergic to EVERYTHING. Dust. Tree, Pollen, Rag Weed. Basically anything natural. The list can go on and on. I am LITERALLY allergic to about 20 things. When I took the test a few years ago, the doctor was even surprised by my results. I’m just highly sensitive. Anything can be doing it. I just don’t know. Hopefully it’s not chronic hives. Hopefully, there is a CAUSE and we can just remove the trigger from my life. But how can you remove the night and heat? I’m feel really defeated…. Vera, I had a similar outbreak last fall! After going to see a dermatologist and allergist, the only problem that I had with the medication that they gave me meant that I had to pump and dump! What ended up working the best for me was a combination of acupuncture and an herbal formula to help with the itching. Both were safe and holistic so I could continue nursing. Not sure if you’re nursing Caleb but wanted to pass that tip along. I feel for you. Last winter I would wake up scratching my legs to pieces. Literally drawing blood. The Doc suggested Uremol cream and I couldnt believe the results. Not saying it would work for you but just sharing my story. Also I find now that when I use the same soap that I have used for years it seems to flare up. One good thing to look forward to – winter is coming (LMAO omg Im a Stark ) and with it cooler weather.